We are going out on a limb right now and guessing that you probably didn’t know this car existed. No, not the Civic. You would have to be living on Kaffeklubben Island not to know about the Civic. We’re talking about the 2008 Honda Civic GX. 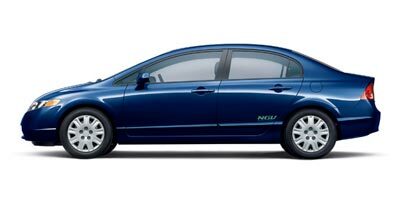 This is a regular four-door Civic with one very special difference: it is powered by compressed natural gas (CNG). Sure there are a few drawbacks to driving this piece of tech, there is less trunk room, a 200-mile range and a serious drop in horsepower. The technology, found most frequently among company fleets, is pricey too. But it affords you with the option to drive a car with almost zero emissions and avoid using expensive oil. A large problem in the past with CNG vehicles has been the lack of readily available filling stations, but now there are personal pumps you can install directly in your garage. And, say you are out on the road, there are more than 1,500 public and private CNG filling stations around the country, situated along major highways as well as in large cities. You also get the comfort, standard features and drivability found in all Civic trims. If you want to start saving the planet now instead of waiting for future technologies to appear, the GX is a good place to commence the rescue operation. The Civic is already a much-loved car; knowing that it’s good for the Earth makes it even more special. Comfort remains at a high level, thanks to the standard features found in all Civics. Despite its higher starting price over the regular trims, the car is eligible for a $4,000 federal tax credit. The natural gas tank takes up much of the trunk, making it just wide enough for grocery bags. The mileage range is limited, leaving you to plan road trips around appropriate filling stations. And, at $6,000 more than a comparably-loaded Civic, the GX is a serious investment - though the abovementioned tax credit lessens the blow. You almost expect the drive to be drastically different when the car is fueled with ultra-cool compressed natural gas. Initially, stepping on the throttle results in the same feel and sound you’d get with a regular gas engine. Then you start driving around and realize that the GX isn't quite as zippy on the road. At 113 horsepower, the absence of standard Civic’s extra 27 horses is grossly noticeable. It has slightly more power than the Honda Fit, a car that weighs almost 400 pounds less. This affects passing situations and leaves you lacking speed when getting on the freeway. To somewhat counterbalance the deficit, the transmission does a nice job of efficiently dropping down the gears when necessary. Its steering may not be as direct as we would like, but it is responsive. The GX also has a forgiving suspension perfect for city driving or awkward dips on the freeway. Peace and quiet is always appreciated, and with the GX’s well-muffled interior, that CD will be heard loud and clear. This Civic is only available in a 1.8-liter four-cylinder engine. It produces 113 horsepower and 109 lb-ft of torque. The front-wheel drive sedan is only available in an automatic transmission. Like any Honda, the Civic GX has plenty of features to keep you comfy throughout your drive. Cruise control, a tilting/telescoping steering wheel, air conditioning and power windows and locks are all standard. XM radio is available through dealer accessories options to add depth to the GX’s 160-watt CD/MP3 audio system. The use of natural gas in cars is hardly unusual. The concept is more popular in Europe, Asia and South America, where they have a large infrastructure to support the vehicles. Using natural gas for fuel to begin with isn’t such a stretch either. It is combustible, just like gasoline, and it is more efficient because natural gas allows for higher compression ratios. However, the technology found in the GX has also spurred on the jump to hydrogen-powered cars, like Honda’s FCX Clarity. Here’s where things get interesting. The GX returns a very similar gas mileage as other Civic trims at 24 mpg city and 36 mpg highway. This one has a stellar emissions rating of AT-PZEV (Advanced Technology Partial-Zero-Emission Vehicle). That’s one step away from emitting exactly nothing out of the tailpipe. And because CNG is cheaper than regular gasoline, you will instantly see savings at the pump or home filling station. A two-tier instrument panel features a heads-up display with a digital speedometer read-out and basic, but functional, control dials and buttons. The dash is so large that seeing over the hood – or even seeing the hood at all – proves impossible. Seats are cloth and hug you nicely, though sitting three across in the back may get a little too cozy for your passengers. The compact Civic has a sloped snub-nose that transitions into a rounded and sleek body style. A-pillar cutouts improve overall visibility. The GX rides on 15-inch wheels and the side is adorned with NGV stickers to denote its natural gas vehicle status. The Honda Civic GX starts at $24,590. As far as we know, there isn’t another CNG-powered passenger vehicle currently available on the market. Still, you’d be rewarded for looking at these fuel savers as well – the $23,550 Honda Civic Hybrid, $22,000 Toyota Pruis and $21,990 Volkswagen Jetta TDI. We love new technology, and helping the Earth any way we can is a big bonus added to the daily drive. However, the Civic GX sacrifices a lot to do so. Less cargo space, more frequent fill-ups and a significant drop in power makes the purchase more complicated. If all that doesn't deter you, we’d highly recommend taking this slightly more unusual route in your quest for an efficient car.